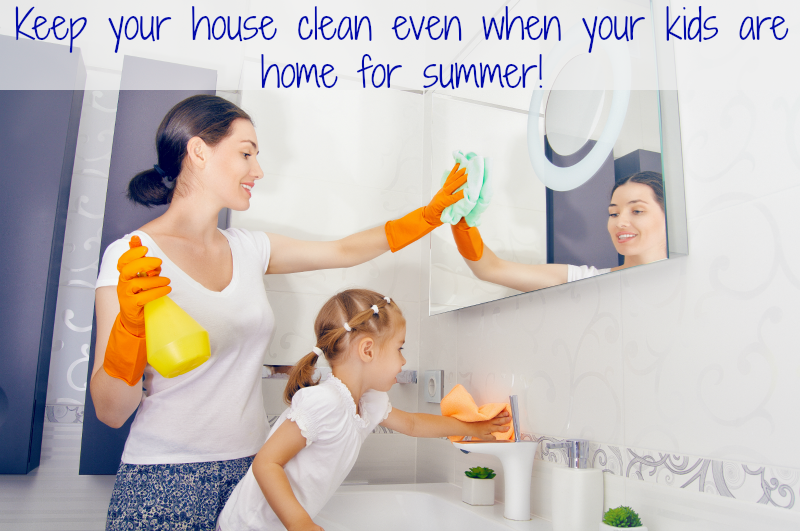 Keep your house clean even when your kids are home for summer! While you may be excited that your children are home for the summer, you may also be dreading the mess that will become the normal state of your home. It doesn’t have to be the norm, however. You can keep your house clean while your kids are home without going crazy, wasting time, or neglecting a moment of fun with them. Here’s how! Make a schedule: kids respond well to schedules, especially after being on a school routine. Keep them used to routines by making a schedule for their summer activities and your cleaning. For example, make Monday and Thursdays the laundry days. Tuesdays and Fridays can be floor and dusting days. Things like dishwasher can be done 30 minutes before bed each night and you can involve the kids. This will teach them responsibility and help you keep things tidy. Don’t allow clutter: Keep junk mail cleared daily. Don’t allow things to get out of place. Teach your kids that when they take out a toy, they need to put it back. Don’t bring in too much unneeded stuff into your home, or you will find yourself overwhelmed with clutter within a week or two. Keep it to a minimum coming in, and you won’t have to spend hours getting it out. Teach your kids the chores: Every day, you can all clean your own bathrooms and bedrooms. This doesn’t take long and even toddlers can help keep things clean. Teach them the chores and they can help you. Dividing the work means more time for fun. Contain the kids and the mess: If you start to get behind on housework, contain the kids to a room with fun things to do to keep them occupied. You can clean the rest of the house, taking frequent breaks (every 15-25 minutes) to check on them or play with them. After the house is under control again, take the kids out of the house and have fun. Once they’re in bed, spend some time cleaning the one room where they made messes all day. Do a four task a day goal: If you have extra projects to work on during the summer, limit it to four 15-minute tasks daily. This will allow you to get your projects done while not spending the whole day focusing on them. You can even get kids involved on some of the more time-consuming and fun projects, like painting. In the comments below feel free to share your tips on how you keep your house clean during the summer! Great article on cleaning up after the kids, we’ll be sure to keep these tips in mind! For other pesky messes that pop up over the summer I found this great article: https://seattlehousecleaningtips.wordpress.com/2015/06/23/the-5-best-summer-cleaning-techniques/ I’ve already used some of these techniques and they’ve worked wonders! Hope this helps!